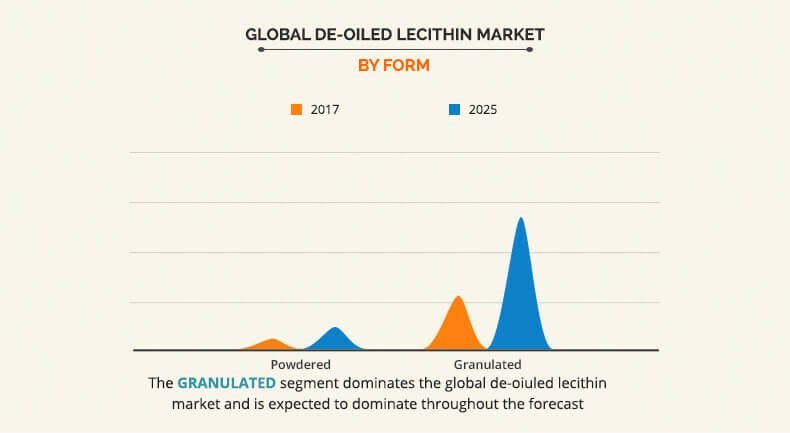 The global de-oiled lecithin market size was valued at $152,906.4 thousand in 2017, and is projected to reach $396,526.4 thousand by 2025, growing at a CAGR of 12.4 % from 2018 to 2025. De-oiled lecithin is a dry form of lecithin and has multi-functional properties across various industries, food, feed, and healthcare. It is enriched in phospholipids for enhanced dispersion in water, de-oiled lecithin is available in the form of granules or powders. Dry lecithin has advantages such as convenient handling and a neutral flavor and color. It is an essentially ready nutraceutical, offering nutritional benefits to consumers. It is used in dietary foods such as tablets & capsules; in bakery products; and convenience foods such as instant soups and sauces; this highlights the multi-functionality of de-oiled lecithin. The food segment accounted for the highest share in 2017. However, the de-oiled lecithin market for healthcare segment is anticipated to witness lucrative opportunities throughout the forecast period. The growth of the global de-oiled lecithin industry is driven by factors such as increase in demand for green and organic food products globally and growth in trends among consumers involving weight loss and calorie concern in developed countries, owing to rise in working population in the developing nations, and increase in demand for convenience food with nutritional benefits. In addition, functional and natural ingredients in the food & beverage products play a key role in the dietary aspect of a healthy lifestyle, hence, de-oiled lecithin is witnessing an increase in demand, as a result of this trend. 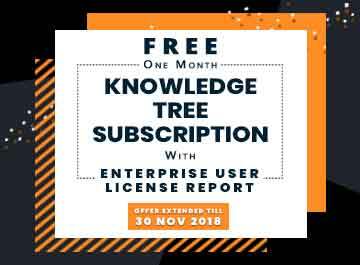 Rise in disposable income of the consumers coupled with growth in health awareness among consumers significantly boosts the growth of the de-oiled lecithin market. Furthermore, acetone present in de-oiled lecithin, is widely used for the de-oiling of lecithin, as it extracts about half of the inactive vegetable oil from the crude lecithin. In this method, acetone is added to the crude lecithin, and de-oiled lecithin is obtained after the evaporation of the added acetone leading to increase in the phospholipid content by about 40% after the de-oiling process. Growth in concern among consumers regarding natural and organic food ingredients is encouraging the consumers to shift toward clean label products. This fuels the demand for label-friendly de-oiled lecithin leading to increase in their adoption by a large population worldwide. Although excess consumption of it may have negative impact on health. Conversely, adverse reactions can cause nausea, diarrhea, stomach pain, and other diseases. Also, genetically modified foods such as soy de-oiled lecithin may act as a threat to the environment. However, increase in demand for label-friendly products among consumers is expected to fuel the growth of the de-oiled lecithin market. The global de-oiled lecithin market is anticipated to offer opportunities for the manufacturers including production of organic soybeans to fulfill the global demand for organic de-oiled lecithin. De-oiled lecithin is available in the form of granules or powders. Dry lecithin has advantages such as convenient handling and a neutral flavor and color. It is an essentially ready nutraceutical, offering nutritional benefits to consumers. It is used in dietary foods such as tablets & capsules; in bakery products; and convenience foods such as instant soups and sauces. This highlights the multi-functionality of de-oiled lecithin. De-oiled lecithin is mainly derived from soy, sunflower, rapeseed, and eggs. 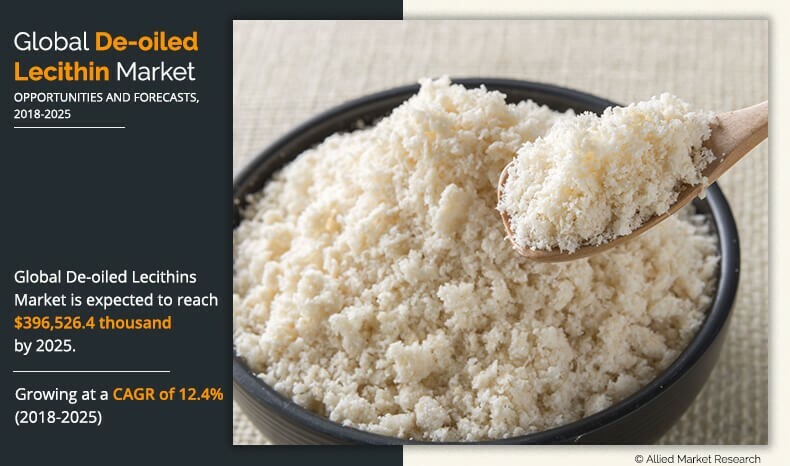 Although de-oiled lecithin is mainly extracted from soybean oil by the addition of water and centrifugation, it has been witnessing a decline in demand, owing to concerns related to allergens and GMO foods. In 2016, According to the International Service for the Acquisition of Agri-biotech Applications (ISAAA), soybean was the largest genetically modified crop at a global level. This augments the demand for alternate sources such as sunflower and rapeseed. However, the supply of sunflower lecithin is not sufficient to fulfill the required demand. The report segments the global de-oiled market based on form, source, and application. Based on form, the market is divided into powdered and granulated de-oiled lecithin. Based on source, it is classified into soy, sunflower, rapeseed, and egg. Based on application, it is categorized into food, feed, and healthcare. The soy segment dominated the global de-oiled market in 2017, accounting for around 36% de-oiled market share of the overall revenue. This was due to the ability to recover faster from illness and increase survival rate. Also, farmers focus on producing organic soybeans to fulfill the global demand for organic de-oiled lecithin. Furthermore, this segment is expected to grow at a significant rate during the forecast period. In 2017, the food segment led the global market, owing to its chemical properties that bind two liquids that do not mix well together. This allows consumers to view their food in a smooth, consistent, and quality manner. Key players are investing in this industry owing to their numerous benefits and high consumption. Thus, food segment is expected to expand in upcoming times, and thus boost the sale of de-oiled lecithin. This report provides an extensive analysis of the current trends, emerging estimations, and dynamics of the global de-oiled lecithin market from 2018 to 2025. A comprehensive analysis of factors that drive and restrict the de-oiled lecithin market growth provided. 8.2.AMITEX AGRO PRODUCTS PVT. LTD.
De-oiled lecithin is a dry form of lecithin and has multi-functional properties across various industries, food, feed, and healthcare. It is enriched in phospholipids for enhanced dispersion in water. Acetone is widely used for the de-oiling of lecithin, as it extracts about 40% of the inactive vegetable oil from the crude lecithin. The growth of the de-oiled market is driven by increase in prevalence of health concerns, growth in trends among consumers involving weight loss, and calorie concern in developed countries. The granulated segment accounted for maximum share in 2017, owing to presence of acetone, as acetone is widely used for the de-oiling of lecithin, as it extracts about 40% of the inactive vegetable oil from the crude lecithin. The soy segment dominated the global de-oiled lecithin market in 2017, accounting for almost half the share, and is expected to grow at a significant growth rate during the forecast period. The sunflower segment is expected to witness the highest growth rate during the forecast period. The food segment accounted for the maximum share and is anticipated to grow with a significant growth rate during the forecast period, owing to its chemical properties that bind two liquids that do not mix well together. This allows consumers to view their food in a smooth, consistent, and quality manner.